Ok but how can a julienne peeler help you eat more vegetables. Simple, julienne greens are fun to eat. You also can vary which different veggies. For example, you don’t eat a whole carrot (because it’s to chunky), But thin julienne in a salade are more easy to consume. Also slicing julienne can take up some time. The consequence of this is that you may postpone or eat less veggies. 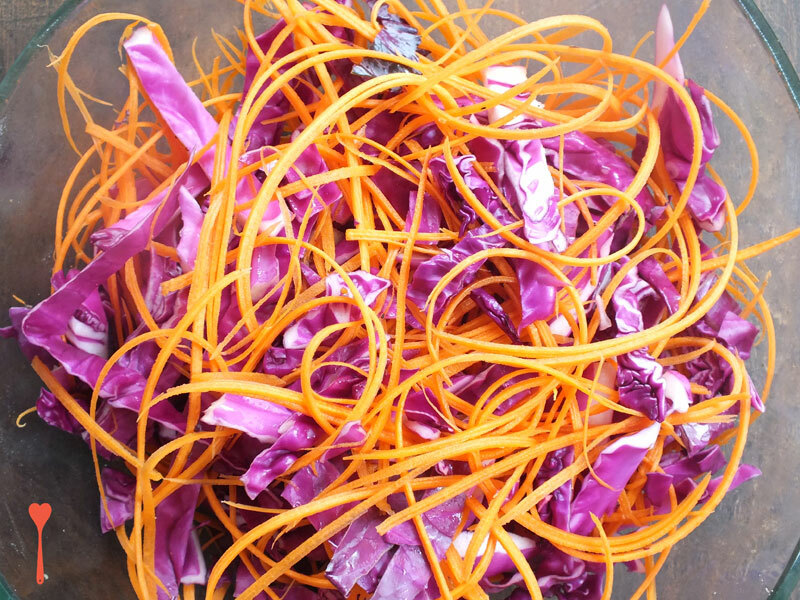 When you use a julienne peeler your vegetables and fruits will be sliced in no time. Many diets propagate that carbs are bad for you and that the food pyramid is outdated. Personal I read and heard a lot about this topic. Just do a google search “Are carbs good for you” to find more information. My personal option is that we eat to many carbs that are in bread and pasta. To reduce your “pasta” intake you can replace pasta with vegetable noodles. My favorite is zucchini and pumpkin noodles. To make noodles I prefer a noodle maker instead of a julienne peeler because the noodles are longer and thicker and more spaghetti like. A second option is to mix your spaghettis vegetables. In this case is a julienne peeler your best friend. You can go to ways, you can add your julienne vegetables to your spaghetti or add them to the pasta sauce. When you cook vegetables they lose nutritions and minerals. They are still healthy but less healthy as row vegetables. The problem with raw foods is that they are chunky and sometimes dull. When cooked they taste much better and are softer. To counter these drawbacks you can cut them in julienne so they are conformable to eat. When you add vinaigrette, the veggies will marinate. Marinating is also a form of cooking that gives more taste and help to soften the vegetables. This way you can eat your veggies raw and still have all the minerals and nutritions you need to stay healthy. No a julienne peeler won’t save your life but will help you to live and eat healthy. And indirectly you will live longer.